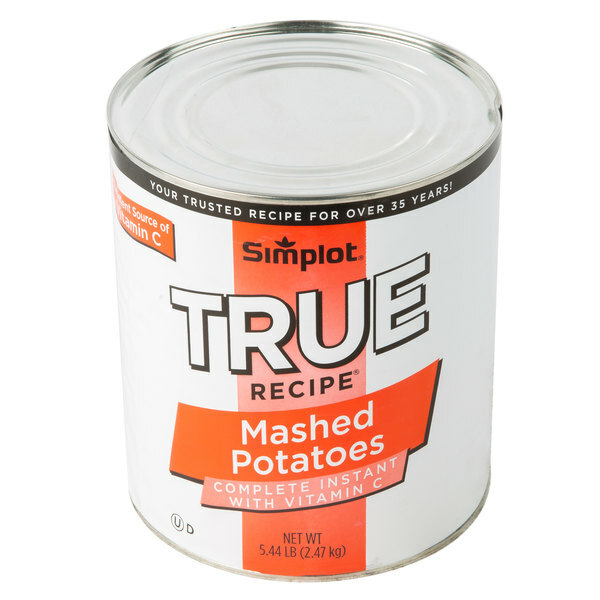 Cut from select, fresh Russet potatoes, these Simplot easy-to-prepare instant mashed potatoes provide the delicious taste of warm, fluffy, made-from-scratch mashed potatoes without the time consuming labor and expense. Simply add water, mix, and allow your customers to experience the taste of classic comfort food they know and love. Instant mashed potatoes are an indispensable addition to any kitchen needing to prepare large volumes of mashed potatoes on a regular basis. Create traditional favorites like Shepherd's pie, or serve with a hearty Salisbury steak. These creamy mashed potatoes with a smooth consistency make a perfect pairing for just about any meat or poultry dish. Add in toppings your patrons are sure to enjoy, like cheese, garlic, or chives. Whether used as a side dish or mixed into casseroles, these mashed potatoes will not fail to impress at your restaurant, buffet, or catered event. 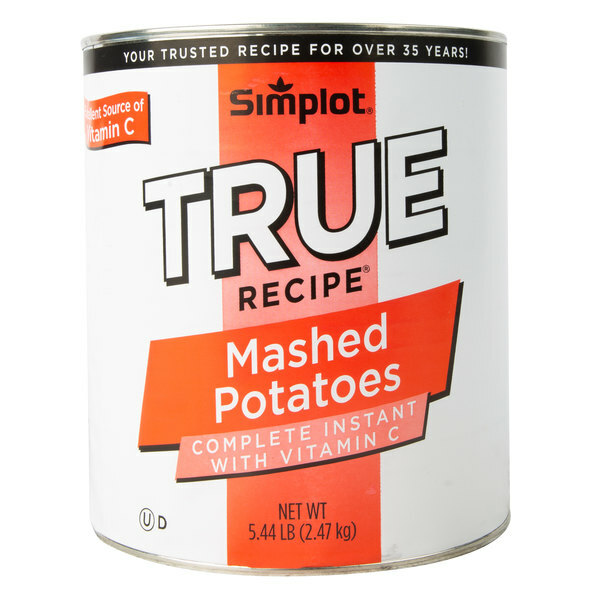 The Simplot instant mashed potatoes are a life saver. The quality is great and they always turn out for us. They are perfect for buffets and serving lots of people. Love!!! Hands down the best mashed potatoes!! I like my mashed potato smooth. but making them from scratch is too time consuming to get the right consistency. Just add alittle extra butter and garlic powder. I was a little iffy when I bought this can of mashed potatoes but decided to give them a try. I was not too impressed and they were very watery. Best instant mashed potatoes ever! Wow, I can see this case is really going to last me a while! Highly recommended to anybody who eats potatoes. Great for single parents or disaster preparedness. 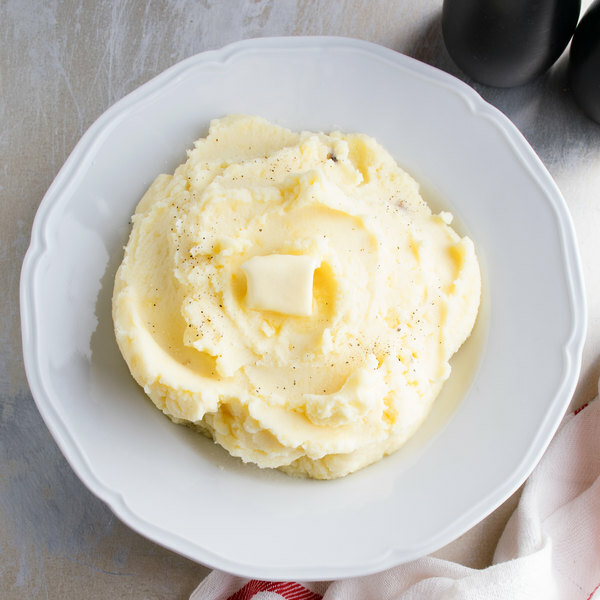 These instant mashed potatoes are very quick and easy to make as well as delicious! Great price for the amount of people you can serve as well. Best brand of instant mashed potatoes out there! We use to get this brand years ago but had to discontinue use because the price had gone up through our distributor at the time. We are so happy to have found this brand at a decent price! 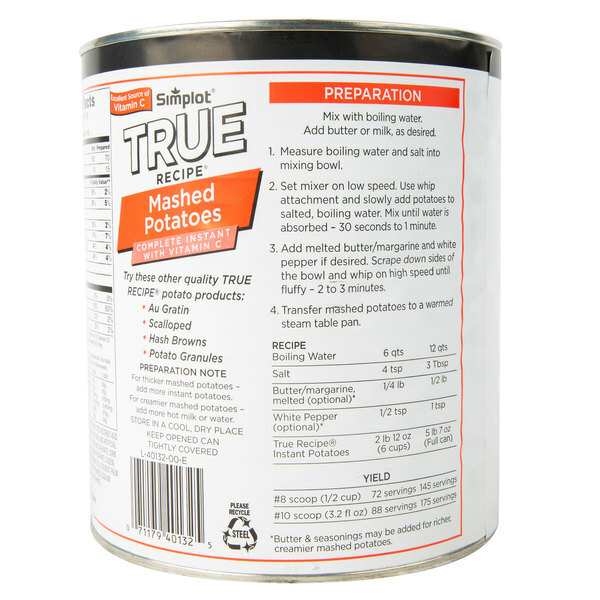 The product comes out consistently perfect and creamy, we do add some spices to give them more flavor but you really cant go wrong with True Mashed Potatoes. These instant mashed potatoes make cooking easy. The cans seem to better preserve the food than the usual box containers. These make decent mashed potatoes. The best mashed potatoes I have found, super concentrated, so one can goes a long ways. No more running to Sam's Club for mashed potatoes!! Since our first purchase, we've never allowed ourselves to run out. Very easy to prepare and even without adding "extras" the taste is quite good. 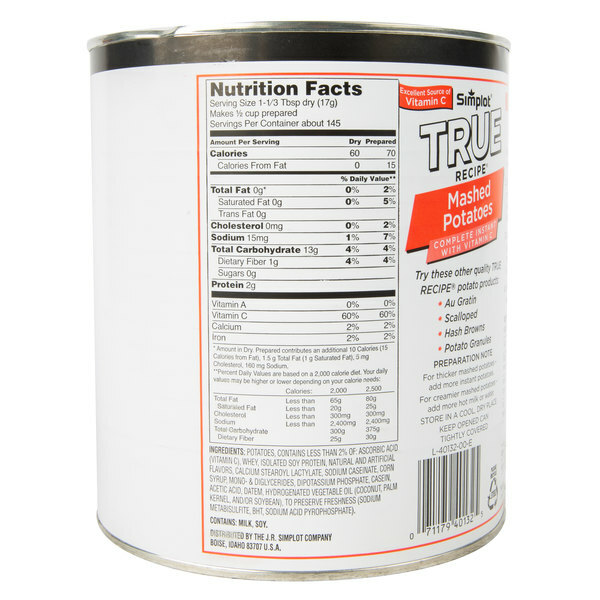 It's also a good thickener for soups and stews. this is the best instant potatoes it taste great it goes a long way it only take a little to make a lot. most people will not know its instant. Very convenient and easy to use. We did not find that it was thick enough using the suggested recipe on the can though. Mixes up very fast. These far outweigh anything you will ever get at the store. I am a home user, and these have replaced any instant potatoes I can find, as well as peeling real ones. They are close to real potatoes that you can get. High quality and great taste. I love these! These are for home use for me and well worth getting for nights when a quick dinner is called for. These potatoes are smooth and creamy or you can make them thick as well. Taste is very good I don't even need to add salt. Will be buying again. I am not a fan of instant mashed potatoes, but these are awesome! The guest really thought these were not instant. One can feeds about 190 people. I recommend them highly! This is the ONLY place I have been able to find this type of instant potato without buying a whole case. These blow away any instant potatoes you can get at a retail store by far. Use heavy cream and butter and these will pass for fresh most anywhere. I love these potatoes. I searched everywhere for them. When I came across your website I was so glad to see that you had them. I highly recommend these potatoes and this website. There is no comparison when it comes to these potatoes. They are the only instant potatoes (in my opinion) that really don't taste instant. They last a long time as well. I keep them in stock in my pantry at all times. These are simply DELICIOUS! For 4 people we use 1C Potatoe Mix & 3 C boiling Hot Water, 1/3C Half & Half & 1 TBLSP Real Butter. Now if you want Un-Traditional you can do all the above & add Real bacon bits (Handful), Dollop sour cream, 1 C shredded cheese (any kind). DELICIOUS this way as well. They remind me of potatoes I use to have in school back in the day. These last about 1 month for the can. 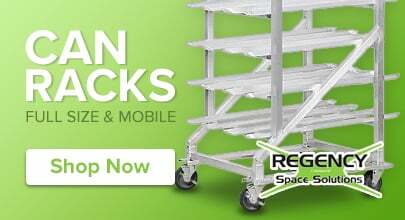 This is a great product for cafeterias and institutions. Great for making large batches of mashed potatoes. Great tasting but easy to enhance with fresh cheese or flavorings. Great Instant mashed potatoes. Easily prepared and tastes great. You can add milk instead of water for a creamier texture & add your own spices. Will buy again. These instant mashed potatoes are great! Instead of cutting, boiling, and mashing up potatoes. You can easily scoop them from the can. these instant mashed potatoes are so delicious! you can save a lot of time and a lot of money by utilizing these. very great taste! Save time and money with these instant mashed potatoes!! Easy to open, heat up and blend with cream and butter for a rich and delicious side dish!!! I have found that this website has a lot of nice brands, this one included. This product is convenient and has a good flavor as well. The Mashed Potatoes come in a #10 Can. You can't beat the price and how much it serves .We use it in our sheppards pie,nobody can tell the difference just add alittle butter and can milk instead of water great tast. These are outstanding potatoes. They taste great, just add a little flavor and spice and their absolutely wondeful. Taste as good, if not better than the real thing. You cant beat the price, and they hold up better in a hot well than regular potatoes. Outstanding value. Over 100 servings for that price? Done right, instant wins over fresh potatoes, unless you can extrude through a fine plate grinder/ricer. Very good consistency and flavor. I was looking for an alternative for the mashed potatoes that I bought at the supermarket since they were too expensive, so I decided to give these mashed potatoes a try. I was not disappointed with my decision because the mashed potatoes came out nice and creamy with tasty flavor. I recommend these mashed potatoes to anyone because it is a good value and quality.